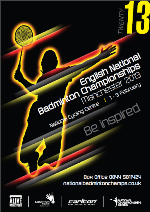 Tickets for the 2013 English National Badminton Championships are now available. Taking place from 1st - 3rd February at the National Cycling Centre in Manchester, the championships feature all the best players in the country. Tickets start from just £8 so check out nationalbadmintonchamps.co.uk now for more information and to buy your tickets.